An increasing number of new laws across the United States make it a crime to be homeless. But these laws don’t actually manage to get people off the streets ― they just perpetuate the cycle of homelessness, experts say. Homelessness has reached such crisis levels that a United Nations expert sent to investigate poverty and inequality in the U.S. included the criminalization of homelessness in an extensive report released last Friday. After spending two weeks meeting with communities facing some of the most dire circumstances, Philip Alston, the U.N. special rapporteur on extreme poverty and human rights, concluded that mistreatment of people experiencing homelessness is one of the key contributors to the stark levels of inequality. Philip Alston, U.N. special rapporteur on extreme poverty and human rights, visited the U.S. for two weeks and concluded that the criminalization of homelessness is a contributing factor to inequality in the U.S.
Homelessness is on the rise in the U.S., an issue that’s inextricably tied to a lack of affordable housing. But instead of investing in sustainable housing options and job retraining programs, which have proved to work and save taxpayer dollars, states continue to pass more laws that essentially make it impossible for people to escape the streets. Such laws make it illegal to stand, sit, sleep, panhandle and partake in other basic functions in public. In turn, police officers dole out fines, which often start out small but quickly balloon into crushing debt for a person without means. Those who are arrested, even for minor offenses, end up with a criminal record that add another obstacle to employment and housing. Since 2006, bans on sitting and lying down in public have increased by 52 percent in the 187 cities that the National Law Center on Poverty & Homelessness tracks. Bans on sleeping in public have increased by 31 percent over that same period. These laws are particularly cruel considering people sitting or sleeping outdoors often have nowhere else to go. The U.S. has seen a dramatic rise in tent cities over the past decade, in a response to a shortage of shelters, according to a new report from NLCPH. Even those who manage to gain access to shelters often have to make difficult tradeoffs. Going to shelters often means being vulnerable to theft, and many shelters limit the items people can bring, which forces people who are homeless to discard belongings. “You give up all this property for the guarantee … of a spot on the floor for one night,” Eugene Stroman, who lives in an encampment in Houston, told NLCHP. Pedestrians pass an expanding tent city under an overpass in Washington, D.C., last week. Shelters also typically shut their doors during the day, which means that people who are unhoused have to spend at least part of it on the streets ― standing, sitting or lying down ― and risk getting punished for it. According to the Department of Housing and Urban Development’s latest estimates, there were 553,000 people living in emergency shelters, transitional housing programs and in unsheltered settings in the U.S. on a single night this year. That marked a slight increase from 2016. The number of people without shelter in high-cost areas increased “significantly,” according to the report. But NLCHP believes that those figures are underestimated because of flaws in HUD’s methodology. For example, the numbers don’t account for people in jails and prisons during the time of the count, Maria Foscarinis, founder and executive director of the National Law Center on Homelessness & Poverty, told HuffPost. “These numbers can be large,” Foscarinis noted, “and include people incarcerated for violating laws criminalizing homelessness.” HUD also fails to account for people who don’t have sustainable housing but aren’t necessarily visible, including those who crash on couches or sleep in cars. 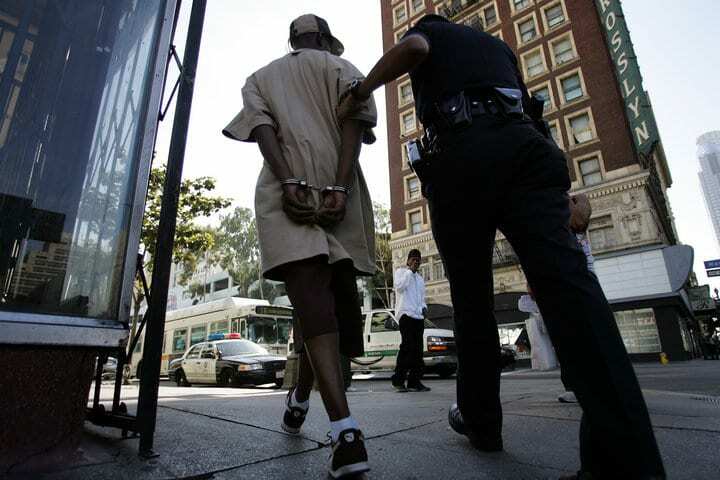 Low-income people living in expensive areas are bearing the brunt of the criminalization. In California, homelessness increased by 26 percent this year from 2016, according to HUD. Los Angeles reported 6,696 arrests of homeless people on skid row from 2011 to 2016, for example. “Rather than responding to homeless persons as affronts to the senses and to their neighborhoods, citizens and local authorities should see in their presence a tragic indictment of community and government policies,” Alston said during a news conference in Washington, D.C., on Friday. In recent years, some cities have tested the concept of “housing first” and have seen promising results. The concept encourages giving people a place to live first, then addressing employment and medical issues, rather than the other way around, which is how may social service programs work. In Los Angeles’ skid row area, a homeless man rolls down the street to a soup kitchen. Moore Place, a nonprofit in Charlotte, North Carolina, houses 85 chronically homeless people. In its first year, tenants saved $1.8 million in health care costs alone, a 2014 report found. A hefty portion of that is from a major drop in emergency room visits. Housing comes to about $14,000 a year, per tenant. Tenants contribute 30 percent of their income toward rent. The rest comes from private and church donations, and local and federal government funding. San Francisco saw similar results after the city provided supportive housing to nearly 2,000 homeless people. From 2011 to 2015, the city’s costs associated with dealing with homelessness declined by $31.5 million, or 56 percent, according to a report released last year by San Francisco’s Budget and Legislative Analyst’s Office. While numerous case studies have demonstrated that “housing first” works, Foscarinis says that misinformation and a wish for an immediate fix are preventing other cities from implementing such programs. Many people mistakenly believe that anyone who is homeless is a lost cause because mental health and addiction issues might be factors, said Foscarinis. Perhaps the harder challenge is convincing lawmakers that investing in long-term, supportive services is worthwhile. CORRECTION: A previous version of this story misstated the location of Moore Place. It is in Charlotte, North Carolina, not South Carolina.